Have you ever wondered how people get those beautiful bold blog graphics, the ones with text overlay, that are themed and all fit nicely together? These are the kind of graphics you would use if you share your blog posts on PInterest. 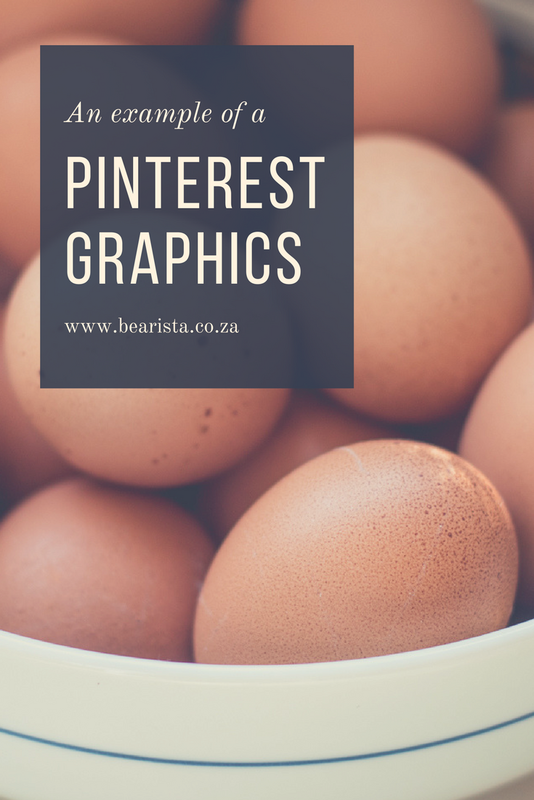 Because Pinterest is such a powerful search engine, it's a great place to get the word out there about your blog, and there is no better way of doing this than by using long-form images with text overlay that people are able to identify as helpful to them at a glance. Recipes, 'How To's', DIY Projects, Step-by-Step Guides, and Fitness Routines are just some of the categories I'm referring to that usually use this kind of eye-catching image/text combination. Here are some examples, so you know what I'm talking about. Anything from how to take care of cast iron pots, to typography sins you'll want to avoid. Instead of using the same old stock images, I wanted to see if I could come up with my own DIY-ed photos that work well for Pinterest, and then share my process with you. I'm going to split this blog post into a few sections: the first part will be sourcing your own original images from around your home and neighbourhood. The second part will be designing the graphics in one of my favourite (and FREE!) online platforms, Canva. If I have to choose between mediocre/bad original photography and beautiful stock imagery, I will always go for the better quality stock photos. If that's where you're at and you feel totally overwhelmed when it comes to taking good quality original photos, or you just don't have the gear required, then I would recommend sticking with stock photography. There are so many great options out there, and you're bound to find something that fits with your look, feel and subject matter. There are, of course, a great many free stock photo sites to choose from. Some of my favourites are Unsplash, Splitshire, and KaboomPics. If, however, you would like to make your blog (Instagram, Pinterest etc.) truly yours by using your own original photography, then this post is for you. With the priority placed on visual content these days everywhere from Twitter to Facebook, there's real pressure to source good quality photography. Many businesses aren't yet in the position financially to hire a professional photographer for their visual content or to purchase stock photography on an ongoing basis. These things can be expensive! But when you don't use original stuff you run the risk of repeating the same imagery that everyone else is using. And I think that detracts from your online presence. I thought it might be fun to take you through the process of DIY-ing your own blog images sourced from totally accessible locations like your home, your neighbourhood, and your garden. Keep the composition simple: because you're going to overlay the image with text, you don't want the image to be too busy and confuse the reader. Try a two-thirds/one-third approach: try to keep at least two-thirds of your image clean. (like a wall, floor, white space etc.) - this is negative space. Make sure there is a lot of natural light: bright, clear, crisp photos stand out from among the sea of photos out there. Portrait vs landscape: Depending on your blog layout, you'll want to shoot either in portrait mode (the vertical side is longer), or landscape mode (when the horizontal side of the image is the longest). I think that's it. Let's look for some photo opportunities. I use both my camera (a very entry level DSLR EOS 1300D) and my iPhone 6S for my Instagram, Facebook, Pinterest and Blog photos. I find that because my phone is always on me, it's the camera I'm more likely to use. But if I'm intentionally going to look for subject matter to photograph for my blog, then I'll probably use my DSLR with a 50mm 1.8 lens. People call it the 'nifty fifty' for a reason. Whatever you're using today, just grab your camera and let's start! Unless you live in a glass house (! ), then the best time of day to take photos in your house is when it's at its brightest. For me, that means early morning before about 8:30. After this time, the sun is positioned directly over the house and makes things a little gloomy inside. When you take photos in natural light, you get the best quality images, and you don’t have to edit the brightness later, or push up the ISO while shooting. Go into every room and walk around slowly, looking at eye level, looking down, looking up and noticing elements that could form a little vignette*. I recommend going for a close up approach. At close range, you're more like to capture texture and colour in an abstract way. Look out for the colours of your logo, brand, site, or colours that you like. Colour can come in the form of fabrics, clothes, decor items, crockery in your cupboard, furniture, surfaces, book covers and so on. A pop of colour with this turquoise ceramic jar and wooden spoons. The combination of negative space, colour and texture will work well for a blog graphic I think! I selected a bunch of loosely folded shirts and jerseys from my cupboard when I realised I had a bit of a colour theme going on. Baskets, woven material, mohair, plants, wood, scarves, bed linen, fruit & veggies. All of these textures make for great subject matter or even a helpful background for your subject. Stay away from shiny reflective surfaces like kitchen counter tops, glass, and polished items. Natural textures will absorb the light and pull the eye in to the photo. Work spaces, whether digital, creative, or DIY related work well for blog posts. They have a sense of activity and purpose and inspire creativity. Photograph your desk, kitchen counter in the middle of dinner prep, or your brush lettering class. Whatever it is, make sure as I've mentioned before, to leave quite a bit of negative space. I took a photo from above while I was in the middle of repainting a bookshelf. There's range of items here, including the essential cup of tea. I just took a photo of a bunch of my pens, pencils and paintbrushes which I usually keep in this pottery jar. Against the light wall it allows a lot of room to add some text as an overlay later on. You might find you have a collection of strawberry coloured scarves, or bold multicoloured cushion covers, or blue and white crockery. Collect like colours and arrange a pile of jerseys, or t-shirts and throw things together in different ways. You’ll be amazed at the compositions you can come up with. Take photos from eye level, get down low, or stand on a chair to achieve a ‘birds-eye view’ aspect. In this photo, I stood on the arm of my couch to get the fynbos foliage against the background of the dark parquet flooring. The photo I got - some fynbos leaves in a vase against the dark parquet flooring. Because of the shallow depth of field with my 50mm lens, the foreground is in focus while the background blurs out. Just to give you a some perspective on the angle when I took the previous shot of the fynbos - I was up on the arm of the couch, shooting down. Move things against a white or cream wall, put something on a dark floor, or a wooden table top. When you use an uncluttered background it makes your subject stand out in a defined and eye-catching way. These dried up proteas (still pretty though, right?) were placed against an open wall in a bright part of the room. Now I have plenty of room to add some text overlay, blocks, or whatever else I might want to. I wrote a whole bunch about this over here so I won’t go into it in greater detail now, suffice to say that flat-lay is a style of photography that is super popular on Instagram at the moment. It involves arranging a bunch of things on a surface and taking a photo of the scene from above. Step 11: Take a break, make a cup of tea (and photograph that too). I took this photo with my iPhone. I think you can get some pretty great photos with your phone, so don't feel you HAVE to go out and buy a camera. I wouldn’t recommend overdoing the editing phase - don’t oversaturate, or add 80% clarity, or anything too radical. I also recommend keeping your editing process fairly consistent so that over time your photos become recognisable as yours. Not a sharply contrasted black and white image today, and then a hazy, vintage looking photo tomorrow. That becomes confusing for your reader. The last step is to export the photos, making sure that the file size isn't so big that it slows your whole site down and chases your readers away! Here are some more pics I took today from around the house that I think could work well as blog graphics. They really are as mundane as the bathroom window, a collection of beaded jewelry, and an old enamel teapot. Up next: adding text elements. Now that we have some material to work with (our own original photographs!) - its time to turn them into those good-looking Pinterest graphics. My next blog post will cover this, so stay tuned. In the meantime, here's a sneak preview of how this picture of a bowl of eggs (nothing fancy right?) into a pinnable blog graphic. How do you set up your blog graphics? Are they portrait/landscape? Do you use a text overlay? Do you post them to Pinterest? I'm be interested to hear more about your process.